This past June, I was able to tag along with some friends from the photography club I belong to on a trip to Kyoto – a city I had not visited for several decades. The oppressive heat had already arrived in the old capital. It was just a whirlwind trip – one night, two days. Undeterred by the scorching sun, I lugged my heavy camera and lens around, spending hours absorbed in snapping photos as I went sightseeing at Ginkakuji, Saihō-ji, Ryōan-ji, and Matsunoo-taisha. Unfortunately, the lush green moss at Saihō-ji (“moss temple”) had turned a shade of brown due to the lack of rain. On top of that, it was crowded everywhere I went – I think when I visit Kyoto again, it will be in the winter when there are not as many tourists around. There are countless wonderful photos of Kyoto shot by others in existence – everyone wants to take photos that reflect their own style. For now, shooting those types of photos will remain a dream and I will make do with this collection of the scenes I came across during my very short stay. 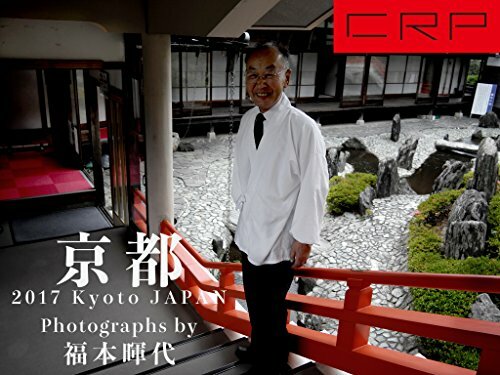 The selection of photos, cover design, and composition for this collection was undertaken by the renowned Akira Gomi. It is my hope that it conveys the atmosphere of Kyoto in 2017.